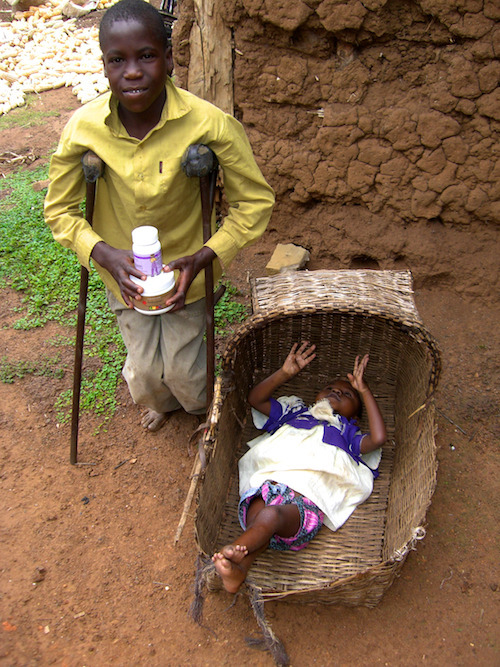 In 2006, Brandon and Darnelle Donnell from Burleson, Texas began to provide nutritional support to Gentle Shepherd Children’s Home, an orphanage home in Kenya. Nearby, the Donnell’s met a family with six children, two of which were Gabriel and Beatrice. 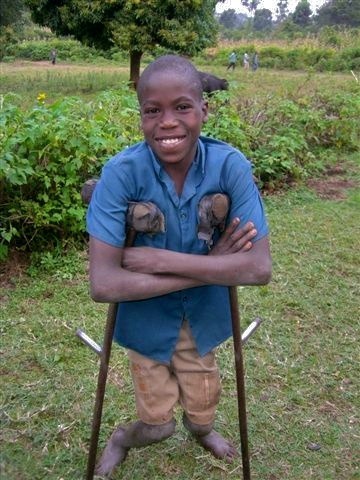 Gabriel, who was 10 years old, is handicapped and has no use of his legs from his knees down. 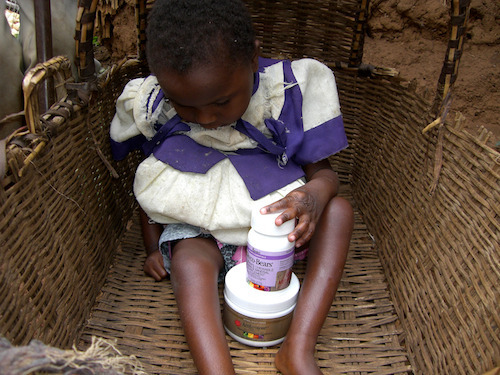 Beatrice, 4 years old, was unable to walk, talk, sit-up by herself, or focus her eyes. During the day the parents would go to work and the children were left at home alone. Darnelle knew there was something she could do to help, so she found some crutches for Gabriel and decided to give the children nutritional support provided by MannaRelief. Last year, Darnelle was able to provide the family with a stroller for Beatrice with the hope that she would be taken outside more. Darnelle felt encouraged when she noticed Beatrice was starting to focus her eyes! When Darnelle returned at the beginning of 2010, she was surprised to find Beatrice in her stroller, outside, sitting up by herself and making noises, which she had never done before! She also learned that Gabriel had been volunteering to help with the add-on construction for Gentle Shepherd Children’s Home. Not letting his disability hold him back, he learned to use the crutches Darnelle gave him to pull himself up to the second floor of the building! Beatrice sitting up by herself. The family is very thankful for the nutritional supplements and even say they have made a positive difference in their children’s lives. Elizabeth, the Director of the children’s home now asks every time Darnelle comes if she brought any nutritional support. She and the family are eternally grateful! Gabriel is now 14 years old and Beatrice is now 8. If you were inspired by this story and would like to contribute to the fund for Gentle Shepherds Children’s Home and Gabriel and Beatrice, you can donate here and specify ‘B512’ in the “Optional Information” section.